Celebrated as one of BMC’s greatest white elephants, the Austin 3 Litre emerged the way it did because circumstance was not on its side. The Austin 3 Litre development story is one that’s packed with bad decisions, and even worse luck. The Austin 3 Litre was a commercial disaster. There is no other way of putting it. The thinking and ideology behind the creation of the 3 Litre was straightforward and worthy enough – there had been a continuing need for BMC to have a representative in the 3-litre class. 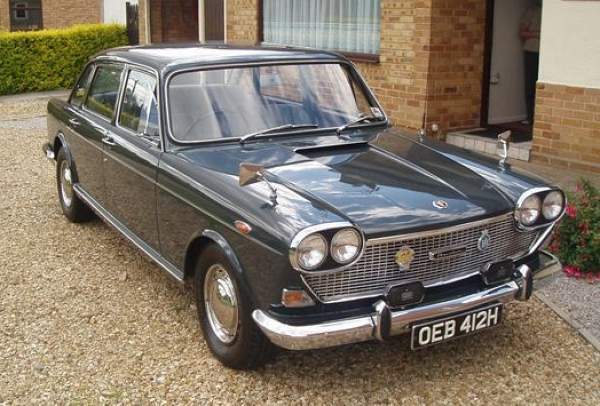 This was a marketing requirement for the company and in the UK, this market was split five ways between the Austin Westminster (and its badge engineered derivatives), the Vauxhall Cresta, Ford Executive, Rover P5/P5B and Humber Super Snipe. It was quite simply (Rover aside), a totally unremarkable bunch of cars built in order to satisfy a demand. 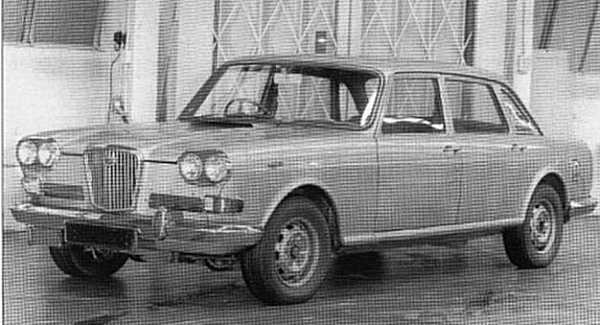 BMC’s offerings in the class were the C-Series engined Austin A110 Westminster, the Wolseley 6/99 and the Vanden Plas 3 Litre. 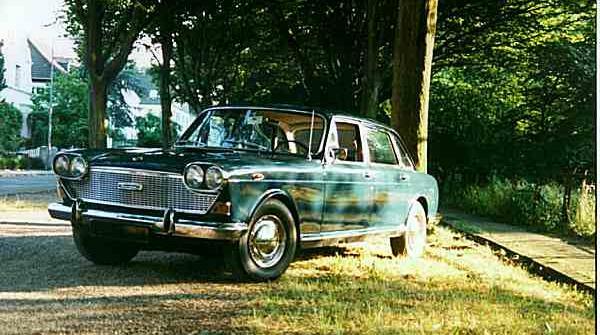 Basically, they were 3-litre versions of the Farina saloons and as they were based on a saloon that had never covered itself in glory, it went as read that these cars were not the most inspiring cars on the market. Bentley Java prototype was developed using the Vanden Plas 3 Litre as a basis – when the project was scrapped in 1962, its engine was used in the Vanden Plas 4 Litre R, and its suspension founds its way into the ADO61. However, during the early-to-mid 1960s, Rolls-Royce began to investigate the idea of moving downmarket into the market sector just above this, and began talks with BMC. The idea was that they could use the Vanden Plas 3 Litre as the basis for its own smaller car, thereby providing Rolls-Royce with the suitable basis for a downsized luxury car; BMC would also benefit from this work, because they would be able to call on much of Rolls-Royce’s work to benefit themselves and strengthen their own executive car offerings. 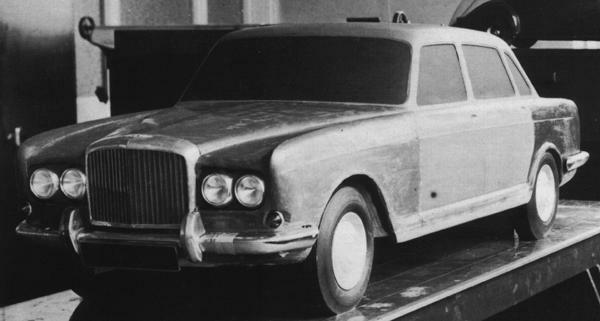 In 1961, work began in Crewe on the Bentley Java – an idea conceived through the need to develop a luxury saloon on a shoestring. Rolls-Royce used the Vanden Plas 3 Litre as a basis, but in place of the C-Series engine, they used the 4.0-litre 6-cylinder F-60 engine – a power unit derived from a previous Rolls-Royce and at one time earmarked for the aborted Bentley Burma. Rolls-Royce management were still concerned about the effect on the marque’s prestigious reputation, by this move downmarket, and so, as a result, the Java was conceived as purely a Bentley model. Work on the Java continued apace, and by March 1962, the first running prototype hit the roads – basically a ‘cut and shut’ Vanden Plas 3 Litre with the F-60 engine now fitted (and it was this car that BMC later used as a test bed for the Vanden Plas 4 Litre R). 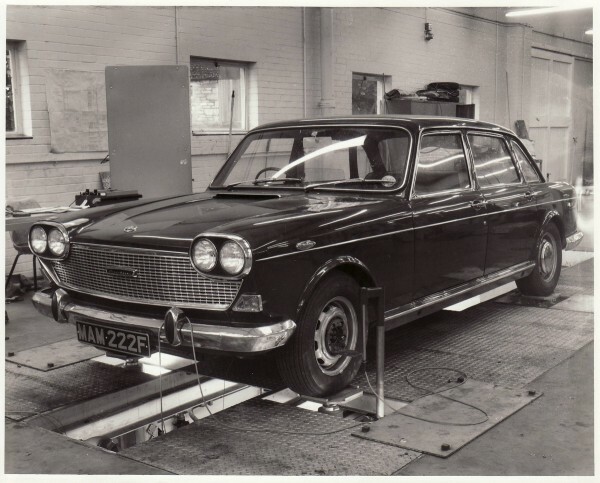 Prototype of the Vanden Plas 4 Litre R – the car that George Harriman insisted that BMC could sell 200-per-week of: the concept of the car was fundamentally sound, as was the Kingsbury developed interior and exterior restyle. Despite this, it failed to live up to Harriman’s ambitious sales targets. 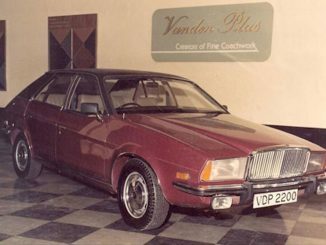 The styling of the Java showed some variance from the Farina based Vanden Plas, but not nearly enough to disguise its origins completely. It has to be said that the styling was reasonably successful effort, with an imposing frontal treatment that reminded commentators of the Facel Vega FV from 1954. By November 1962, the Java had been subject to second thoughts at Crewe and the project was cancelled. Once the Java was officially dead, the company released the F-60 engine to BMC, and the work undertaken on the Java would go on to benefit BMC. 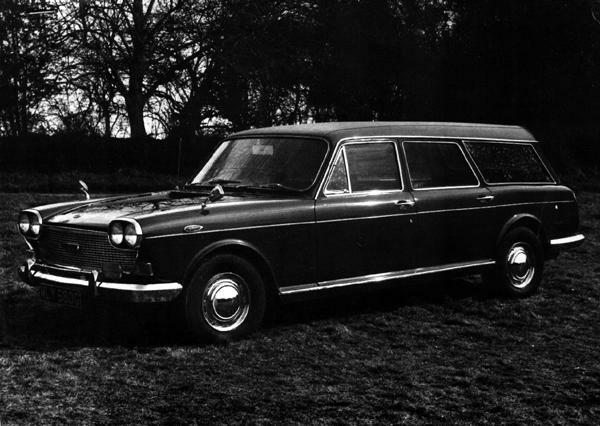 George Harriman was very keen on the concept – and pushed ahead with the development of the Vanden Plas version, the 4 Litre R, which would subsequently appear in 1964. In fact, with the Vanden Plas 4 Litre R, BMC learned a lesson in humility because it was created specifically to fall into the company director part of the car market, but was priced just below the important £2000 purchase price tax break point. Any company car purchased that cost over this price was subject to a swingeing increase in taxable duty – and so, BMC thought they had pulled off a marketing masterstroke when they secured a supply of 3.9-litre Rolls Royce F-60 engines (called FB60 in the BMC application) for use in the car. Equipment levels were hiked massively and this car was expected to sell in comparatively large numbers – the Rolls-Royce link being seen by BMC is being a positive selling point. Unfortunately, this plan was scuppered on one major point that overshadowed the upmarket image the car was supposed to convey. The problem with the 4 Litre R was that its all-alloy engine, was well known for having its roots in the military field – and although it was lighter than the C-Series engine, its origins were a subject that could not be shaken off. Like its 3 Litre cousins, the relatively heavy engine made the balance of the car somewhat nose heavy, and as such, made its handling understeer-biased and steering cumbersome – acceptable perhaps in lower priced versions, but not so much in the range topping Vanden Plas. The driving experience was considered underwhelming by the press and the image of the car was completely undermined by the fact that most prospective buyers were all too well aware of the engine’s origins – in fact; a B40 version of the engine was used in the Austin Champ! Sales were resultantly dismal and one would have thought that maybe the company would have learned an important lesson from this car. But they did not. 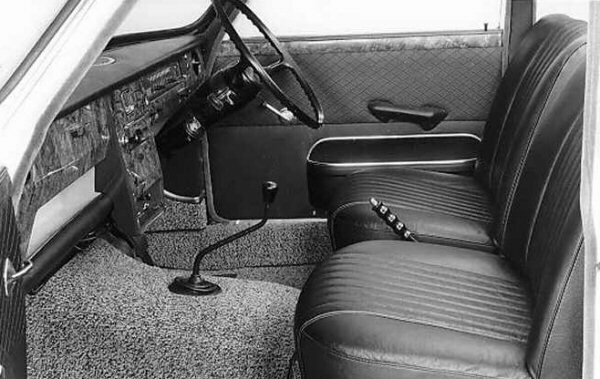 The psychological need for BMC to remain in the ‘director’s car’ market was such that they continued to press ahead with a new model in the sector, codenamed the ADO61. By the early sixties, the BMC Design Department was becoming increasingly dictated to by the accountants of the company and so, soon imposed their influence on the new car. 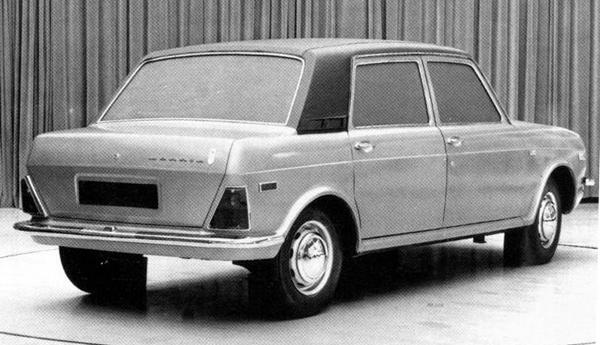 When BMC was in the early stages of the planning for the new car, the decision was made to use the entire centre section of the yet-to-be-launched ADO17, but with unique and elongated front and rear ends, styled with help from Farina. In fact, during the development of the Java, Rolls-Royce also looked at developing a version of the ADO61 for their own use – the car, called the Bentley Bengal and Rolls-Royce Rangoon was quickly quashed by the company, but only after the decision was made to use the Java’s suspension and engine in it – something that BMC, again, found rather appealing. At this stage of development, this may have looked like a pleasing economy for both companies, but a questionable decision when one looks at the styling of the donor car. Styling aside, the ADO61 was developed in a logical and predictable way. Unlike the previous three BMC-designed cars (Mini, ADO16 and ADO17), the new car would be entirely conventional in its engineering – there would be no room for unconventionally engineered cars in this most conservative of markets. Initially, the plan was for the C-Series unit to be used in the new car as it had already seen service in the Westminster/Wolseley 6/99, but in the interests of increased refinement, it was deemed necessary to redesign the power unit’s bottom-end internals – as it was also being planned to use the engine in the MGC (ADO52). Where a four-bearing crankshaft sufficed before, a new seven-bearing crank was installed. The transmission of the ADO61 was four-speed and the driven wheels were the rear wheels, which was a retrograde step for BMC. By the time the car had reached an advanced stage in development and its design was set, the cost cutting measures that the accountants had put in place may as well have not been undertaken: commonality with other cars in the range was minimal apart from the most obvious sheet metal and so, economies of scale through component sharing were minimal. Unlike the engine/gearbox set-up of the ADO61, the suspension system adopted for the car was rather less than conventional: Like the ADO16 and ADO17, Hydrolastic was the springing medium, used all round. However, unlike its smaller brothers, the rubber springs at the rear were separated from the Hydrolastic displacer units. The idea of this was to smooth the ride even further, which BMC managed with some aplomb – which partially explains its excellent ride quality, along with the ADO61’s much greater weight – but also because a change in the pickup-point of the connecting pipes into the displacer-chamber reduced the typical bounce to near zero (it should also be noted that this modification was later incorporated into the Austin Maxi‘s suspension setup). The rear suspension used the now-familiar Hydrolastic spring and damper units, supplemented by a self-levelling facility. This height adjusting rear end was a system that was completely independent of the car’s main suspension set-up and in a nutshell, the height was, regulated via a set of hydraulic rams. The pressure output by these rams was regulated via valves that sensed the level of the car – lowering it if it is too high, raising it if it is too low. An engine driven-pump powered the system, but as the system was regulating the ride height whether the engine was running or not – as long as there was residual pressure in the hydraulics. This was seen as a ‘must have’ by BMC, which saw that this small splash of ingenuity would set the car apart from its domestic rivals. It must be said that this philosophy of trying to offer something more advanced in the chassis department did result in a car blessed with superb ride quality. Unlike the previous three BMC new cars, Alec Issigonis had no hand in the development of this car – in fact, Issigonis positively wanted nothing to do with the car. Ron Nicholls would head-up work on this car, but he had no involvement in the concept of the car. 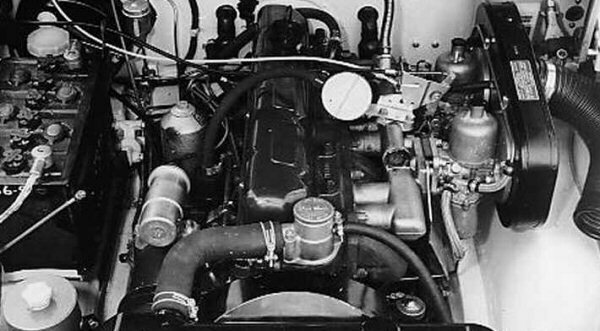 Whereas ADO15, 16 and 17 were the product of Issigonis more or less single-handedly, the ADO61 was the brainchild of George Harriman, himself – and the finer points of the design were hammered-out by the BMC Board and Rolls-Royce. Such muddled conception was the father of a rather confused big car. Alex Moulton would be closely involved with the suspension, though. He bought one of the earliest cars – A 3 Litre de Luxe Automatic, registered MAM222F – evaluating Hydragas suspension set-up. 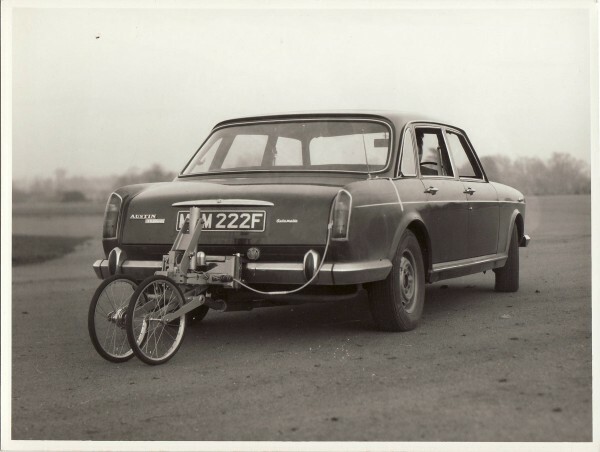 The two images below, from Guy Vincent of The Dr Alex Moulton Archive, show the car under development. The first is on Moulton’s test rig in October 1968 undergoing body shake tests as part of a project investigating body boom and harshness at 90mph. The second image is at Keevil Airfield, Wiltshire, showing the car undergoing ‘Clotoide’ tests with a fifth wheel attached to the back of the vehicle. 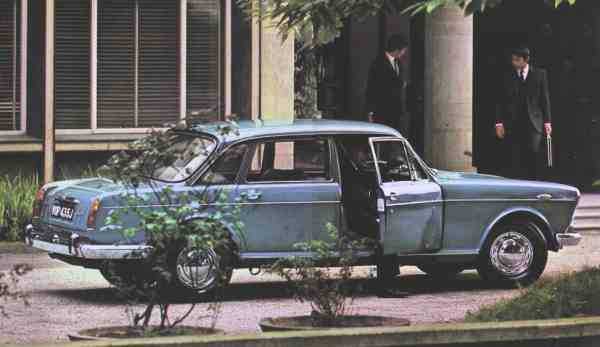 It would appear that the first full-size prototype of the ADO61 was produced in 1963 (before even the ADO17 was launched) and what is very striking about this was that it looked almost identical to the Austin 3 Litre in its final production form. 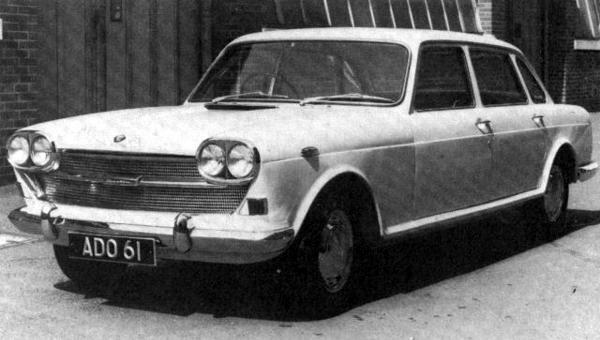 The styling even at this early stage could only be described as imposing, but the obvious question of how the car would compare with the Austin 1800 was, it appears, left unuttered. As events transpired, it actually took four years from the appearance of the first prototype (below) to the car being unveiled to the world – events in the wider world of BMC had obviously overtaken the ill-fated ADO61. Development appeared to drag on through the 1960s and, like all products from BMC before and afterwards, the press were well aware of the car’s existence long before any official announcement had been made. 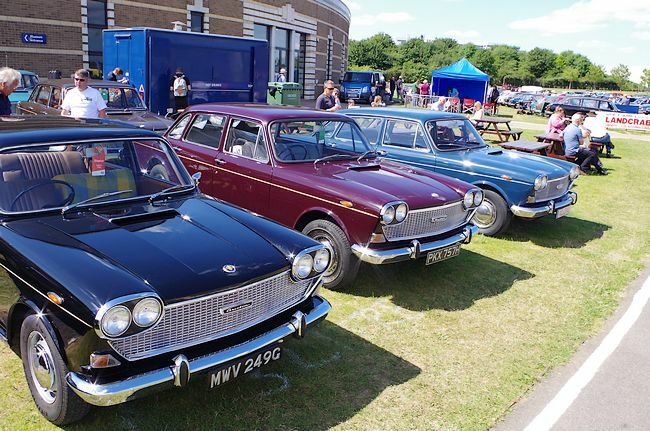 Interestingly, the launch of the car to the public was a long and drawn-out affair because its announcement to the press took place almost a year before the car actually went on sale – something Triumph were also guilty of with the 2000 in 1963. The press launch took place at Longbridge in the lead-up to the 1967 Motor Show and, in a professional presentation given by Raymond Baxter (the then BMC/BMH Public Relations Officer), the event was set-up so that the new car would be presented at the end of the show, to be the climax of the event. Raymond Baxter did his utmost to build up an air of anticipation in the assembled journalists, but when the Austin 3 Litre was wheeled onto the stage, it was met with a ripple of polite applause followed by an embarrassed silence. The trouble was, of course, that the Austin 3 Litre was so obviously ADO17-based that it practically begged for the inevitable question to be asked: what advantages did this car offer over its smaller counterpart? It was not until the following year that the press would find out – an,d of course, the news was not good. The main trouble was that the obvious ugliness of the car was (for many) an insurmountable problem and those who could get past its looks found that the Austin 3 Litre had so many dynamic shortcomings that it was impossible to think of anything positive to say about the car. For a start, the testers knew that the new incarnation of the C-Series engine was not going to be a sparkler, when they found that in the MGC, it was lugubrious in the extreme. This was the case in the 3 Litre, only more so – because of the vast weight of the new car, it meant that the car suffered from the same engine maladies, such as its unwillingness to rev, but it also had an astonishing thirst for petrol, too. However, the 3 Litre was also an extremely comfortable car to drive – and, if you could look beyond the breathless engine and thirst for fuel, there was little to touch it on ride quality. On that score alone, BMC did gain something from working with Rolls-Royce. By the time the car was released in 1967, it would only be to a select few trusted customers (one hundred of them), who were chosen to run the car for the company on an extended trial. Between the time of the initial launch and this first tentative step towards a full launch, BMH had been taken over by Leyland – and there was a real feeling within the new management to proceed with the launch of the new car, if only to demonstrate very graphically just how much BMH had lost its way. 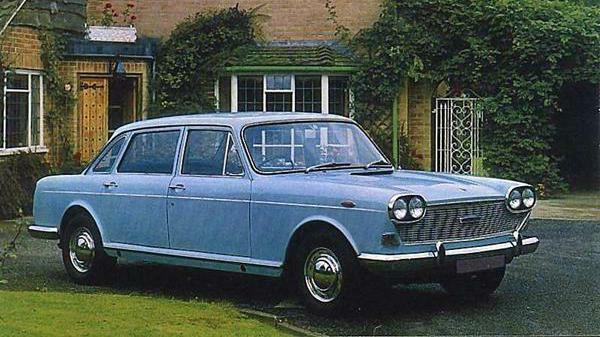 When the Austin 3 Litre finally went on full sale to the public in 1968, it was already an embarrassment to the company. As it was, customers avoided it in huge numbers – and those that did not and chose to go into their local Austin showroom, were practically obliged to ask those same embarrassing questions of the car as the press had done over a year before. As for the car itself, the interior had a nice, traditional wood and leather feel to it, but because it shared the ADO17 centre section and had a large transmission tunnel, it actually offered less space than the smaller car. However, in terms of ride quality, the ADO61 did set new standards of compliancy in its class – all the development work, which had been undertaken on the French Routes Nationale, had paid off handsomely. Unfortunately, there were ergonomic problems as well, not least the dashboard, which offered up a rather mean looking strip speedometer which appeared to have been lifted straight from the ADO16 – not exactly the thing that someone spending over £1500 would be looking for as a desirable feature (to put it another way, in those pre-inflationary times, the Austin 3 Litre actually cost nearly 50 per cent more than the twin-carburettor Austin 1800S – a vastly better car). Of course, the Austin 3 Litre was an outmoded dinosaur – BMH knew that, Leyland certainly knew that – as did the customers. The car was a victim of its own ugliness, for sure, but not only that, but the 3-litre class as a whole was suffering under the two-pronged assault from the Leyland-produced Rover and Triumph 2000s. 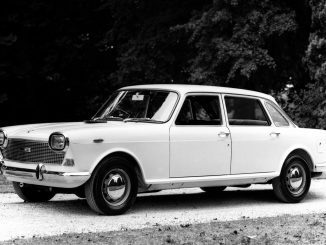 Customers in a position to buy such cars as the ADO61 quite rightly looked at the vastly superior new 2-litre competition and drew the conclusion that this new breed of smaller ‘executive car’ would provide them with all their needs, without the extravagance of a 3-litre car. After the merger, of 1968, BLMC quite rightly allowed the car to go into full-scale production – the tooling costs had to be justified, for a start. This is so, because they could justifiably say that the Austin 3 Litre is a prime example of why BMH so needed to be taken over by Leyland. 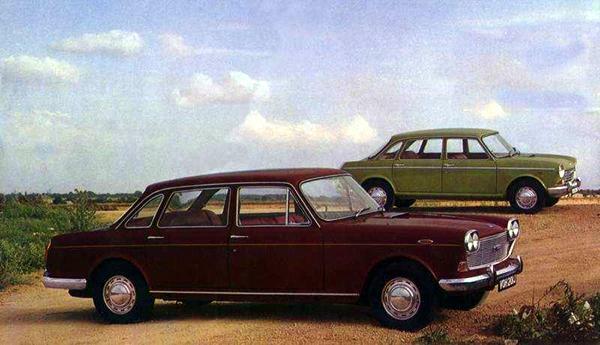 Once, the Austin 3 Litre slipped onto the market in late 1968, it sold disastrously – it never even reached the financial break-even point of 50 cars per week. 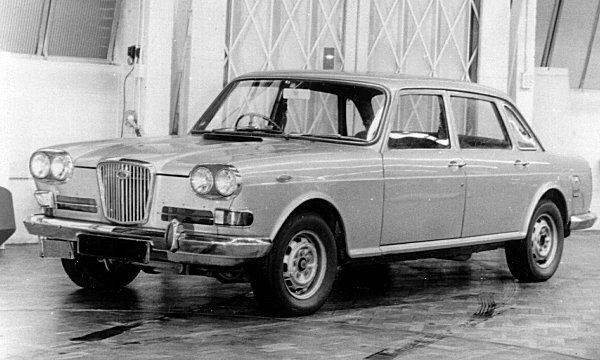 In its three-year production run, a total of 9992 were produced and, such was the magnitude of its failure, that the planned Wolseley version was dropped because it would have sold in negligible numbers. Some thought was given to the car’s development though, because plans were drawn up to install the ‘Rover’ V8 engine under the huge bonnet, but they were quickly shelved – the only prototype of note surviving was the V8-powered ADO61 that Harry Webster himself used. Apparently, it would become a familiar sight in the Longbridge workshops, due to its propensity to break down on a regular basis. British Leyland never even contemplated replacing the car, but with Rover, Triumph and Jaguar in the stable following the merger, why would they need to? Thanks to Alexander Boucke, Declan Berridge and ‘an insider’ for their contributions to this story.